RED DEER – The inaugural month of play in the Alberta Female Hockey League is now in the books, with the Rocky Mountain Raiders (Midget AAA), Red Deer Sutter Fund Chiefs (Midget Elite), and Lloydminster Junior Steelers (Bantam Elite) sitting atop the standings in their respective leagues. Rocky Mountain Raiders second-year forward, Nicole Fry, leads all skaters in goals (6) and points (12), and St. Albert forward Tyra Meropoulis rounds out the Midget AAA skater leaderboard with seven assists on the season. October has been a strong month for goaltenders, as four netminders sit atop the leaderboard with a minimum .960 save percentage. St. Albert’s Brianna Sank has not allowed a goal in either of her first two games, and carries a shutout streak (and a perfect save percentage) into November. Bella McKee started seven of Lloydminster’s first nine games, and led all goaltenders with five wins in October. Outside of AFHL Play, St. Albert participated in the U17 Two Nations Prep Series recently held in Detroit, Michigan. The team went undefeated in tournament play (5-0) and returned home as tournament Champions. Danica Polson of Red Deer leads all skaters in total points (8) and goals (6), while St. Albert’s Payden Bialowas leads the league in assists with five. Red Deer’s Jayda Thompson leads the way for goaltenders with a .670 goals against average and a .970 save percentage, boasting three wins on the season. Once again, goalies are shining in October, with four holding a .960 save percentage or better. First-year Lloydminster forward MacKenzie Stafford leads the way with seven goals in six games played, but is tied for the lead in points with fellow forwards Jessica Hay and Chloe Reid, both of whom skate for the North Central Impact. In net, Jocelynn Pearce of Olds leads the way in just about every goaltender category, with a .500 goals against average, a .980 save percentage and a shutout in two games played. November heats up as all three divisions will showcase 70 games of fast-paced hockey as these 30 teams battle to earn valuable points in the standings during the first half of the season. RED DEER - Registration information is now available for select Midget AAA, Midget Elite, and Bantam Elite Spring Identification camps. How do I know what Draw Zone/Recruitment Area I am in? Can a player access a Midget or Bantam Elite try out elsewhere? Midget Elite and Bantam Elite players are expected to access their first try out within the area that has been identified by the ADM for their Resident LMHA. However, if extenuating circumstances warrant a move, a player may use the Elite Player Movement Application process to move to access a program outside of their identified area. Elite Player Movement Forms must be completed and submitted by July 1st. Who can sign a Player Agreement Form? A Player Agreement Form is for players selected to play for a Midget AAA, Midget Elite or Bantam Elite Team within the ADM. All “AAA” and Elite players must sign a Player Agreement Form prior to the start of the regular season. Underage players are not eligible to sign a Player Agreement Form without gaining approval through the Player Acceleration Process. By signing this document, the player is agreeing to register and play for that specific Member Club for the upcoming season. This document is viewed as binding and it is the expectation of both parties, the player and the Member Club, to uphold their portion of the agreement. Can I sign a Player Agreement Form prior to the start of the season? Each “AAA” Member Club can formally sign up to six players (five skaters and one goaltender) to early Player Agreements between June 15 to August 15th. This is done through the completion of the Player Agreement Form, signed by both parties. “Commitments” made without a written agreement are considered “verbal” and can be viewed as non-binding by either party. Players who have not signed a Player Agreement prior to the beginning of the season are encouraged to attend multiple tryout camps in order to keep all of their options open. If I played AAA last year but would like to play for a different AAA team this upcoming season, is there something I need to do before I change teams? If a player signed a Player Agreement and was registered with a AAA team for the 2018/2019 season and would like to play for another AAA team for the 2019/2020 season, the family will need to request an Elite Waiver from the Previous Registered Team. The signed waiver, complete with rationale must be submitted to the Female ADM Committee prior to the start of tryouts. What is an elite waiver? Players who played “AAA” last season and would like to tryout/sign with another AAA club are required to have a completed Elite Wavier prior to the start of Tryouts. A player who is cut from a Midget AAA, Midget Elite or Bantam Elite team and wishes to pursue the opportunity to try out with a second team. The player would need a completed Elite Waiver from the association that released them from the tryout process. A family would appeal to the Female ADM Committee by providing the Committee with a competed “Notification of Tryout Form” and Elite Waiver Form. The Female ADM Committee will review the application and provide the family with their second tryout option. Do I have a choice of a second tryout? At the “AAA” level, yes. The family and the player have the option of where they would like to go. This information needs to be submitted, alongside the Elite Waiver to the Female ADM Committee prior to moving onto your second tryout. At the Elite Level, no. The Female ADM Committee works with all of the Member Teams during tryouts to understand if there is a need at a certain position (not enough defense at tryouts, no goaltender) amongst the teams. While travel is a consideration in the decision, the Female ADM will offer a second tryout option that would give the player the best opportunity to make a team. The actual start date for tryouts may differ across associations, please ensure you are connecting with that association/team to find the proper dates. Do I need any paperwork to attend a tryout? All players trying out for a “AAA” or Elite team that is outside their Resident Minor Hockey Association needs to have a completed Notification of Tryout Form signed by their Resident MHA. Is there a deadline to hand in my Notification of Tryout Form? Notification of Tryout Forms need to be handed into the association players are accessing their first tryout with prior to the start of tryouts. “AAA” Players who have a preference for their second tryout can state their second tryout directly onto the NTO form. Do I have to find a billet if I move away from home? Each Female ADM Member Association has a billet program in place. They can assist you in finding a billet home while you play hockey. Fees may differ across associations and should be discussed with the Member MHA. How much does this cost a year? Each program is different (amount of ice, travel, team apparel etc). The association you would be able to give your family a more accurate breakdown of the financial obligations. RED DEER - A third trip to the Esso Cup Championship is on the line for the St. Albert Slash as they kick off the Pacific Regional Championships on Friday night. For the third straight year, the St. Albert Slash of the Alberta Female Hockey League will battle the Greater Vancouver Comets for a spot in the Esso Cup. The Slash defeated the Comets in the previous two Pacific Regional Championships en route to back-to-back Esso Cup championships. Games one and two are scheduled for Friday and Saturday at 7:30pm, with game three set for Sunday at 12:45pm, if necessary. All three games take place at the Akinsdale Arena in St. Albert. The 2018 Esso Cup runs April 21-27 in Sudbury, Ontario. RED DEER - The Female ADM Committee have chosen the annual award winners for the 2018-19 season in each division. Mikala is 21 years old and grew up in Lloydminster, but currently resides in Cold Lake. She began officiating hockey when she was 12 years old, and became a level three official as well as a instructor when she was 18. Mikala currently works all levels of minor hockey, as well as male Junior B and men’s Senior AA. She graduated from her primary care paramedic program in 2017 and currently works for Cold Lake Ambulance. In the fall of 2019 Mikala will be attending the Advanced Care Paramedic program at Northern Lakes College. Morgan is a fourth year centre for the MacEwan Griffins and a three time ACAC champion. She is in her second year of a Bachelor of science in Nursing degree. Morgan has been a coach for three years, as well as been the program coordinator and founder of the Jr. Griffins female spring hockey program. Makenna was born and raised in Lethbridge, and started playing hockey at the age of nine. She has played with the Lethbridge Midget Elite Cyclones for the past three years, and was name Captian this past season. Makenna will graduate from the French Immersion Program at Lethbridge Collegiate Institute in June. She has received an early admission offer to the University of Lethbridge in the Bachelor of Nursing Program, and will begin her studies in September 2019. Darcee was born and raised in Delia, AB. She has played with the Midget AAA Sutter Fund Chiefs for the past two seasons. Her time competing in the AFHL has allowed her to accomplish her educational and physical goals as she will be attending the University of Windsor in the fall where she will be playing hockey and studying psychology. Aside from hockey, Darcee has been a member of Team Alberta Baseball for the past six years. She prides herself in being a multi-sport student athlete who has found success in sport and the classroom and she hopes to continue this through post secondary. RED DEER - The AFHL crowned another champion over the weekend, as the Midget Elite Provincial Championships, presented by ATB Financial, were hosted in Grande Prairie. Calgary Fire Red defeated the St. Albert Sharks 5-1 to win the title. Hannah Suto netted a goal and an assist in the win that featured five different goal scorers for the champions. It was the Sherwood Park Fury who took home the bronze after a 6-4 victory over Calgary Fire White. RED DEER – After Calgary Fire Red and the St. Albert Slash were crowned as AFHL Champions this past weekend in Bantam Elite and Midget AAA, the Midget Elite division gets set to take centre stage at the Hockey Alberta Provincial Championships, presented by ATB Financial. You can keep track of all this weekend’s tournaments at haprovincials.ca, by following along with the score ticker at hockeyalberta.ca, on Facebook, Twitter (using the hashtags #HAProvincials or #ATBProvincials), or on Instagram (username: hockey.alberta). Hockey Alberta and ATB Financial are also proud to unveil a new Snapchat filter, available at all Provincial rinks across the province. Players and fans are encouraged to use the Provincials filter, and share it on Snapchat, as well as other social media platforms. RED DEER - The Hockey Alberta Provincial Championships, presented by ATB Financial, continued this past weekend with two AFHL divisions crowning their champions. The Midget AAA Provincial Championships were hosted in St. Albert, where the host St. Albert Slash defeated the Calgary Fire 5-1 to win the title for the third year in a row. Madison Willan continued her terrific season by netting two goals and three assists, while Brianna Sank made 26 saves to backstop her team to the victory. It was the Lloydminster Steelers who took home the bronze after a 2-1 victory over the Red Deer Sutter Fund Chiefs. Red Deer played host to the Bantam Elite championships, where Calgary Fire Red defeated the North Central Impact 6-2 on Sunday to win the championship. Jennifer Shaw led the way for Calgary with two goals, while Kalynah Fong Martin posted 30 saves in the win. Calgary Fire White won the bronze medal with a 3-1 victory over the Red Deer Sutter Fund Chiefs. The AFHL Provincial Championships continue this coming weekend, where Grande Prairie will host the Midget Elite tournament featuring the Peace Country Storm, Calgary Fire White, Calgary Fire Red, Sherwood Park Fury, and St. Albert Sharks. RED DEER – Two AFHL champions will be crowned this weekend in Red Deer and St. Albert for the Bantam Elite and Midget AAA divisions at the Hockey Alberta Provincial Championships, presented by ATB Financial. The Peace Country Storm, Edmonton Pandas, Red Deer Chiefs, and Rocky Mountain Raiders have all advanced to the next round. Awaiting them after a bye week are the St. Albert Sharks, Sherwood Park Fury, Calgary Fire White, and Calgary Fire Red. Check the schedule for game times and locations. RED DEER - As the regular season draws to a close, the St. Albert Slash (Midget AAA), Calgary Fire White (Midget Elite), and Calgary Fire Red (Bantam Elite) all head into the playoffs as the top seed in their respective leagues. Slash forward Madison Willan had a terrific year as she lead the league in goals (24), assists (26), and points (50). St. Albert’s goaltending tandem of Holly Borrett and Brianna Sank were red-hot this season. Borrett paced the league with a 0.86 GAA, and 13 wins, while adding six shutouts. Sank is right behind with a 0.86 GAA, 12 wins and lead the league with eight shutouts. Congratulations to seven AFHL players, as they won a gold medal in the 2019 Canada Winter Games in Red Deer playing with Team Alberta U18 Female: Goaltender Bella McKee (Lloydminster), blueliner Sierra LaPlante (Calgary), and forwards Hayleigh Craig (Lloydminster), Isabelle Lajoie (St. Albert), Payton Laumbach (Lloydminster), Jaden Bogden (St. Albert), and Brooklyn Schroeder (St. Albert). The first round of playoffs are set to get underway this weekend, with Calgary hosting the Rocky Mountain Raiders, and Red Deer hosting Edmonton.St. Albert and Lloydminster have earned first round byes. Calgary Fire Red forward Kelly Stanford took over the lead in total points with 36, while Sherwood Park’s Madison Porter ended the season as the top goal scorer with 24. Her teammate, Reagan Korber, lead the way with 16 assists. Calgary Fire Red’s Cassidy Brown’s 0.90 GAA and five shutouts were both the top mark in Midget Elite, while her teammate Rebecca Boswell, Airdrie’s Jocelyn Pearce, and Calgary Fire White’s Cienna Kinghorn lead the league with 11 wins. With playoff games set to be played this weekend, the North division will feature Edmonton vs. Lloydminster and North Central vs. Peace Country. The South will feature Lethbridge vs. Red Deer and Rocky Mountain vs. Airdrie. Calgary Fire White, Calgary Fire Red, Sherwood Park, and St. Albert have all earned first round byes. Edmonton’s Sage Taylor lead the Bantam Elite regular season with 38 points, while Sherwood Park’s Emerson Jarvis took the goal scoring title with 24. North Central’s Jorja Nystrom lead the way with 17 assists. Jorja Fisher sat atop the league with a 1.24 GAA, while North Central’s Rory Gidosh took top spot with 12 wins. Edmonton’s tandem of Katherine Holan and Teegan Fedoruk were the league leaders with five shutouts each. After the first weekend of the playoffs, there are eight teams remaining. Sherwood Park defeated Peace Country Bonnet’s Storm in two games, while Edmonton did the same versus the St. Albert Raiders in the North division. Sherwood Park will move on to play Lloydminster and Edmonton will face the North Central Impact. In the South it was the Rocky Mountain Raiders defeating Lethbridge, and Red Deer getting past Olds. Red Deer will now face Calgary Fire Red, while the Raiders take on Calgary Fire White. All second round playoff games will take place this weekend (March 8,9,10). RED DEER - As January comes to a close, the St. Albert Slash (Midget AAA), Calgary Fire White (Midget Elite), and North Central Impact (Bantam Elite) all sit at the top of the standings in their respective leagues. Slash forward Madison Willan continues to lead the league in goals (22), assists (18), and points (40). St. Albert’s goaltending tandem of Holly Borrett and Brianna Sank continued their red-hot play this season. Borrett paces the league with a 0.80 GAA, and ten wins, while adding four shutouts. Sank is right behind with a 1.08 GAA, nine wins and leads the league with five shutouts. February is also an exciting month for seven AFHL players, as they’ll compete in the 2019 Canada Winter Games in Red Deer with Team Alberta U18 Female: Goaltender Bella McKee (Lloydminster), blueliner Sierra LaPlante (Calgary), and forwards Hayleigh Craig (Lloydminster), Isabelle Lajoie (St. Albert), Payton Laumbach (Lloydminster), Jaden Bogden (St. Albert), and Brooklyn Schroeder (St. Albert). Madison Porter leads all Midget Elite skaters in goals (20) and sits third in points (24), while her teammate Reagan Korber, along with Calgary Fire White forward Sarah Gaiser are tied for the lead with 13 assists. Calgary Fire White forward Brooke McCool has taken over the lead in total points with 26. Calgary Fire Red’s Cassidy Brown’s 0.98 GAA stays as the top mark in Midget Elite, while Calgary Fire White’s Cienna Kinghorn leads the league with 10 wins, as does Airdrie’s Jocelynn Pearce, who also sits atop the leaderboard with four shutouts. The 2019 portion of the Midget Elite schedule is highlighted by the Midget Elite Showcase, which is set for February 2 & 3 in Leduc, which will feature all 12 teams. Edmonton’s Sage Taylor is tops in Bantam Elite with 33 points, and tied with Sherwood Park’s Emerson Jarvis for the league in goals (19). North Central’s Jorja Nystrom leads the way with 16 assists. Jorja Fisher sits atop the league with a 1.20 GAA, while North Central’s Rory Gidosh and Calgary Fire White’s Kaylee McKay take top spot with nine wins. Edmonton’s Katherine Holan has taken over the league lead with five shutouts. RED DEER - Dates have been set for the 2018/2019 AFHL Playoffs and Hockey Alberta Provincial Championships, presented by ATB Financial. For more information on the AFHL playoffs and provincial tournament formats, see the ‘Playoff Formats’ tab. RED DEER - As 2018 comes to a close, the St. Albert Slash (Midget AAA), Calgary Fire White (Midget Elite), and Sherwood Park Royals (Bantam Elite) all sit at the top of the standings in their respective leagues. Slash forward Madison Willan continues to lead the league in goals (18), assists (15), and points (33). St. Albert’s goaltending tandem of Holly Borrett and Brianna Sank continued their red-hot play this season. Borrett leads the league across the board with a 0.63 GAA, eight wins and four shutouts, while Sank is right behind with a 0.78 GAA, seven wins and four shutouts. December also saw seven AFHL Midget AAA athletes named to Team Alberta U18 Female for the 2019 Canada Winter Games: Goaltender Bella McKee (Lloydminster), blueliner Sierra LaPlante (Calgary), and forwards Hayleigh Craig (Lloydminster), Isabelle Lajoie (St. Albert), Payton Laumbach (Lloydminster), Jaden Bogden (St. Albert), and Brooklyn Schroeder (St. Albert). Sherwood Park forward Madison Porter leads all Midget Elite skaters in goals (14) and points (18), while her teammate Reagan Korber leads the way with 10 assists. Calgary Fire Red’s Cassidy Brown’s 0.77 GAA is good enought for tops in Midget Elite, while her teammate Cienna Kinghorn leads the league with 8 wins, as does Airdrie’s Jocelynn Pearce, who also sits atop the leaderboard with four shutouts. Edmonton’s Sage Taylor is tops in Bantam Elite with 22 points, while Lloydminster’s Lana Duriez leads the league with 14 goals, and North Central’s Jorja Nystrom leads the way with 11 assists. Asia Kachuk sits atop the league with a 0.93 GAA and seven wins, while her Sherwood Park teammate Teegan Fedoruk leads the league with four shutouts. RED DEER - Hockey Alberta and the Alberta Female Hockey League are pleased to announce the host sites for the 2019 Provincial Championships, presented by ATB Financial. The St. Albert Slash, Peace Country PCFAC Storm, and Red Deer Sutter Fund Chiefs will host the Midget AAA, Midget Elite and Bantam Elite provincial championships, respectively. The Bantam Female Elite tournament will run March 21-24, with Midget AAA running the same weekend, from March 22-24. The Midget Elite provincial championship is set for March 28-31. The month-long “March to a title” features provincial championship tournament action during four weekends in March and April, along with four champions crowned through league playoff series. Organizations interested in hosting a provincial championship tournament completed a detailed bid process, with a bid committee evaluating the submissions. A total of 39 Provincial Championships will be hosted across the province, at locations ranging from Grande Prairie in the north and west, Fort Macleod in the south, and Cold Lake in the east. RED DEER - The second month of the 2018-19 Alberta Female Hockey League is now in the books, with the Lloydminster PWM Steelers (Midget AAA), Calgary Fire White (Midget Elite), and Sherwood Park Royals (Bantam Elite) sitting atop the standings in their respective leagues. Slash forward Madison Willan leads the league across the board, with 15 goals and 14 assists for 29 points. St. Albert’s goaltending tandem of Holly Borrett and Brianna Sank are off to red-hot starts to the season. Borrett leads the league with a 0.71 GAA and a 7-0-0 record, and sits second with three shutouts, while Sank is right behind with a 0.75 GAA and six wins, and leads all Midget AAA goaltenders with four shutouts. Sherwood Park forward Madison Porter leads all Midget Elite skaters in goals (13) and points (16). Meanwhile, Calgary Fire White’s Sarah Gaiser sits atop the assist leaderboard with 10. With a 4-0 record with the Calgary Fire Red, Rebecca Boswell’s minuscule 0.50 GAA leads the league, while Airdrie’s Jocelynn Pearce sits atop the leaderboard with seven wins, and is tied with Calgary Fire White netminder Cienna Kinghorn with three shutouts. With 12 goals and 19 points, Lloydminster’s Lana Duriez leads the league in both categories, while North Central’s Jorja Nystrom leads all Bantam Elite skaters with 10 assists. Asia Kachuk sits atop the league with a 0.71 GAA, while her Sherwood Park teammate Teegan Fedoruk leads the league with four shutouts. Lloydminster’s Tiana Stafford is tops in Bantam Elite with six wins. RED DEER - The 2018-19 Alberta Female Hockey League hits full stride this weekend, as the Midget Elite and Bantam Elite seasons kick off Friday and Saturday, respectively. Friday night features a pair of Midget Elite games, with the Rocky Mountain Raiders taking on the Sherwood Park Fury, and Airdrie Lightning visiting the Red Deer Sutter Fund Chiefs. Saturday sees five more games, with four more set for Sunday in a busy opening weekend. On the Bantam Elite side, 10 of 12 teams kick their seasons off on Saturday, while the Calgary Fire Red and Red Deer Sutter Fund Chiefs will wait until the following weekend for their seasons to begin. You can keep track of all the action on each league’s website, or by following the AFHL on Twitter. RED DEER - The 2018-19 Alberta Female Hockey League season officially gets underway tonight (Friday), with the inaugural Midget AAA Showcase Weekend in Edmonton. The Edmonton Pandas and Rocky Mountain Raiders kick things off at 6:15, with the Lloydminster PWM Steelers and Red Deer Sutter Fund Chiefs to follow at 8:45. The St. Albert Slash and Calgary Fire both kick off their seasons Saturday at 11:45 a.m. and 2:15 p.m., respectively. All games are at the Clare Drake arena. The Midget Elite season begins on Friday, October 19, while Bantam Elite season kicks off the following day. RED DEER - The inaugural Midget AAA Showcase Weekend highlights the 2018-19 Alberta Female Hockey League schedule, which is set to kick off on Friday, October 5. The 2018-19 AFHL schedule features a total of 400 games - 90 in Midget AAA, and 155 each in the Midget Elite and Bantam Elite leagues. As the AFHL enters its third season, the Midget AAA league will kick off the year with a regular season tournament for the first time. All six Midget AAA teams will take part in the Showcase Weekend in Edmonton on October 5-7 at the Clare Drake Arena. The Midget Elite league will also take part in a Showcase Weekend in Leduc, February 2-3, featuring all 12 teams. While the Midget AAA season kicks off on October 5, the Midget Elite season gets underway on October 19, with the Bantam Elite season beginning on October 20. If a player signed a Player Agreement and was registered with a AAA team for the 2017/2018 season and would like to play for another AAA team for the 2018/2019 season, the family will need to request an Elite Waiver from the Previous Registered Team. The signed waiver, complete with rationale must be submitted to the Female ADM Committee prior to the start of tryouts. RED DEER - Close to 50 graduating Midget players from the Alberta Female Hockey League will be suiting up for post-secondary teams this fall. In the AFHL’s second season, the number of graduating players has nearly doubled, after more than 20 graduating players were committed to post-secondary heading into the 2017-18 season. BRIDGEWATER, N.S. – The St. Albert Slash became the first team in Esso Cup history to repeat as back-to-back champions, defeating the Saskatoon Stars 2-1 to win gold at Canada’s National Female Midget Championship. After suffering a 4-1 loss to the Stars in the preliminary round, the Slash rebounded in the championship game by opening the scoring with just under three minutes remaining in the first period. Late-period goals were the key to the team’s success, as St. Albert took a 2-0 lead with less than one minute remaining in the second period. The Stars cut the deficit in half 47 seconds into the third period, but could not find the back of net as time expired. “[St. Albert] did a great job. An absolutely great job,” said Greg Slobodzian, head coach of the Saskatoon Stars. “We haven’t been pressured like that in a long time. Our girls didn’t know how to handle it at the beginning, but I thought we answered really well in the third period. It could have went either way." Meropoulis led the Slash with one goal and one assist in the final, while veteran Madison Willan of Edmonton recorded the game-winning goal in the second period. Jayme Doyle of Calahoo also registered one assist in the game. Goaltender Camryn Drever of Edmonton made 14 saves on her way to securing the win, while Mackenzie Butz of Sherwood Park earned player of the game honours for St. Albert. RED DEER – The Alberta Female Hockey League is pleased to announce the 2017-18 league award and scholarship winners. Four awards are handed out in each league: Most Valuable Player, Top Goaltender, Top Rookie, and Coach of the Year. One award is also given for the AFHL Administrator of the Year. The Alberta Female Hockey League annually presents four scholarships; two to graduating players from the AFHL as well as two to young women currently attending post secondary and who are giving back to the game through coaching or officiating. All of these scholarships will be awarded to help off-set the costs of pursuing a post secondary degree at the institution of their choice. The AFHL received an overwhelming response to the scholarship fund and recipients were chosen from an extremely deep pool of applicants. Finalists were chosen based on their strong academics, positive contribution to their team as well as their involvement with their community. Congratulations to all AFHL Award winners and scholarship recipients! RED DEER - The title defence for the St. Albert Slash is about to begin, as the 2018 Esso Cup gets underway on Sunday in Bridgewater, N.S. The Slash are representing the Pacific region at the tournament for the second straight year, and are the reigning Esso Cup champions. The Slash kick off their tournament Sunday afternoon at 12:30 against the Pionnières de Lanaudière. RED DEER - The ’Road to the Esso Cup’ is complete for the St. Albert Ron Hodgson Slash, who will defend their 2017 Esso Cup title after defeating the Greater Vancouver Comets in the Pacific Regional Championship. The St. Albert Ron Hodgson Slash and Lethbridge Midget AAA Hurricanes both won the Pacific Regional Championship to advance to the Esso Cup and Telus Cup, respectively. The Slash defeated the Greater Vancouver Comets for the second straight year, winning the three-game series two games to one. St. Albert took game one 4-2 and lost game two 4-2, before edging the Comets 1-0 to claim the Pacific Regional banner for the second straight year. The 2018 Esso Cup runs April 22-28 in Bridgwater, Nova Scotia. RED DEER - The Road to the Esso Cup continues for the reigning champion St. Albert Ron Hodgson Slash this weekend, as they head to Richmond for a re-match of last year’s Pacific Regional Championships with the Greater Vancouver Comets. The Slash defeated the Comets in last year’s Pacific Regional Championships en route to an Esso Cup championship. Games one and two are scheduled for Friday at 5:45 p.m. and Saturday at 12 noon, with game three set for Sunday at 1 p.m., if necessary. The 2018 Esso Cup runs April 22-28 in Bridgwater, Nova Scotia. RED DEER - The 2017-18 Alberta Female Hockey League season officially came to a close on Sunday, as the Calgary Fire White skated away with the Midget Elite provincial banner. As the host team of the 2018 Hockey Alberta Provincial Championships, presented by ATB Financial, the Fire skated to a 2-0 win over the St. Albert Sharks to win gold in front of their home crowd. Meanwhile, the Calgary Fire Red claimed the bronze medal with a 4-1 win over the Sherwood Park Fury. The Midget Elite Provincial Championships marked the end of the AFHL season, with the St. Albert Slash and Calgary Fire White winning the Midget AAA and Bantam Elite titles, respectively, the weekend prior. RED DEER - The Alberta Female Hockey League season officially comes to a close this weekend, as the last weekend of the Hockey Alberta Provincial Championships, presented by ATB Financial, get underway on Thursday. With the Midget AAA and Bantam Elite Provincials complete, the Midget Elite Provincials will take place in Calgary March 29 - April 1, hosted by the Calgary Fire White. The first game of the tournament goes Thursday at 10:30 a.m. between the Calgary Fire Red and Airdrie Lightning. The St. Albert Sharks and Sherwood Park Fury round out the five-team tournament pool. All scores, schedules and stats can be found on the Hockey Alberta Midget Elite Provincials site. The scores will also be displayed on a ticker at the top of hockeyalberta.ca and afhl.ca. You can also follow along on Facebook, Twitter (using the hashtags #HAProvincial and #ATBProvincials), or on Snapchat (username: hockeyalberta). Hockey Alberta and ATB Financial are also proud to unveil a brand new Snapchat filter, available at all Provincial rinks across the province. Players and fans are encouraged to use the Provincials filter, and send a photo to Hockey Alberta on Snapchat for a chance to win a gift card prize pack from Hockey Alberta and ATB Financial. RED DEER - The Midget AAA and Bantam Elite Hockey Alberta Provincial Championships, presented by ATB Financial, saw a pair of repeat champions this weekend, as the St. Albert Slash and Calgary Fire White skated away with their respective league banners. The St. Albert Slash won its second-straight Provincial title in dramatic fashion, defeating the Rocky Mountain Raiders 3-2 in overtime. Trailing 2-1 with time winding down, Madison Willan scored for the Slash with 7 seconds remaining to force overtime. After killing a full two minute five-on-three Raiders powerplay, the Slash got a powerplay of their own, and Mckenzie Hewett scored to seal the win for her team. The Slash will now headed for a Pacific Regional rematch with the Greater Vancouver Comets, who they defeated last year en route to an Esso Cup championship. The Midget AAA bronze medal game also required extra time, as the host Red Deer Sutter Fund Cheifs only needed 57 seconds of overtime to defeated the Lloydminster PWM Steelers 4-3. It was a close game in the Bantam Elite Championship Final as well, with the Calgary Fire White edging the North Central Impact 2-0 to claim its second-straight Provincial title. Calgary got goals from Ashlynn Stitt and Payten Evans in the first and second periods, and goaltender Alexandra Kieren shut the door to clinch the title. Close games were the story of the weekend, as the host Peace Country Bonnett’s Storm held on for a 1-0 win over the St. Albert Raiders to win the Bantam Elite bronze medal. The Alberta Female Hockey League season officially comes to a close this weekend as the Midget Elite Provincials take place in Calgary on March 29 - April 1. RED DEER - The battle for province-wide supremecy is on in the Alberta Female Hockey League, as the Hockey Alberta Provincial Championships, presented by ATB Financial, begin on Thursday in the Midget AAA and Bantam Elite divisions. The Bantam Elite Provincials kick off Thursday morning at 11:15 as the St. Albert Raiders take on the North Central Impact. The Calgary Fire White, Rocky Mountain Raiders, and host Peace Country Bonnett’s Storm round out the Bantam Elite provincial pool. Meanwhile, the Midget AAA action doesn’t get going until 9:00 a.m. Friday as the Lloydminster PWM Steelers battle the Rocky Mountain Raiders. Also taking part in the Midget AAA Provincials are the reigning Esso Cup champion St. Albert Slash, and the host Red Deer Sutter Fund Chiefs. All scores, schedules and stats can be found on each league’s respective Hockey Alberta Provincials site, which can be found below. The scores will also be displayed on a ticker at the top of hockeyalberta.ca and afhl.ca. on Facebook, Twitter (using the hashtags #HAProvincials or #ATBProvincials), or on Snapchat (username: hockeyalberta). RED DEER - Two outstanding young Albertans are on their way to take part in the 2018 International Ice Hockey Federation’s Global Girls Hockey Game in Toronto. Kamyrn Oddan of Clandonald and Emilie Morin of Enoch were selected out of more than 25 applicants to attend the international event. Two female hockey players from each province are headed to the Global Game, which will see 37 IIHF member organizations hold events across the globe this weekend. Oddan is a 15 year-old forward with the Vermilion Female Bantam B Tigers. "I am so honoured and excited to have the awesome opportunity to play in the 2018 Global Game," she said. "It’s so great to have the chance to meet girls from all across Canada who have the passion as I do. My favourite thing about hockey is the fun I have playing with my teammates. I always try to improve and grow, and I think the Global Game is an awesome experience to learn from, while having fun along the way!" In addition to hockey, Oddan also plays volleyball and badminton, and is involved in her local 4-H club. Morin is a 13 year-old defender, who currently plays for the Edmonton Bantam A Sabres. "Hockey is my passion," she said. "I am so honoured to be representing Alberta, female hockey and Indigenous Canadians at the Global Game!" Outside of female hockey, Morin also takes part in her school’s Hockey Academy, and plays 3-on-3 hockey in the summer, along with softball. Participants spend the weekend in Toronto participating in skills clinics, listening to guest speakers, visiting the Hockey Hall of Fame, as well as participating in the main event, the Global Game on Sunday afternoon. The Ontario Women’s Hockey Association, in partnership with Hockey Canada and the International Ice Hockey Federation, is hosting the Global Game March 10-11 in Toronto. The Global Game embodies the spirit of enjoyment, teamwork, and collaborating with those from diverse backgrounds. This unique game starts on Saturday and will be played in 28 different countries before being handed off to Canada to play the final segment of the game. A cumulative score is kept across all 28 countries between Team White and Team Blue with a winner being declared after the Canadian portion of the game. The goal this game is to unite all females currently playing hockey as one global family. RED DEER - As the 2017-18 Alberta Female Hockey League regular season comes to a close, the Rocky Mountain Raiders (Midget AAA), St. Albert Sharks (Midget Elite), and Calgary Fire White (Bantam Elite) lead their respective leagues. This weekend marks the final weekend of regular season action for Midget AAA and Midget Elite, while the Bantam Elite playoffs kick off on Friday. Rocky Mountain Raiders forward Nicole Fry heads into the final weekend of play atop the Midget AAA leaderboard with 40 points, while teammates Breanne Trotter and Chloe Puddifant lead the league in goals and assists, with 22 goals and 23 assists, respectively. St. Albert goaltender Camryn Drever carries the league’s best goals against average, heading into March with a 1.36 GAA, and is tied with teammate Brianna Sank with a .940 save percentage, while Rocky Mountain Raiders goalie Stephanie Gross leads all Midget AAA goalies with 12 wins. Calgary Fire Red forward Sydney Benko leads the league in goals (30) and points (37), while Peace Country’s Karsyn May and St. Albert’s Annika Neset both lead the way with 14 assists. St. Albert’s Holly Borrett leads all Midget Elite goaltenders with a 0.92 goals against average, and .950 save percentage, while Airdrie’s Cianna Weir leads the league with with 13 wins. Sherwood Park’s Jenna Goodwin ended the Bantam Elite season on a strong note, sitting atop the league in goals (24) and points (34), with North Central’s Jacquelyn Fleming leading the way in assists, with 16. Alexandra Kieren wrapped up her outstanding season with Calgary White, leading the way with a 0.92 GAA, a .950 save percentage, while North Central’s Laney Pasemko is the regular season leader in wins with 15. The 2018 Bantam Elite playoffs officially kick off on Friday, as the Olds Grizzlys (4) battle the Red Deer Sutter Fund Chiefs. The other South Division series between the Rocky Mountain Raiders (3) and Lethbridge Cyclones (6) begins on Saturday, as do the North Division series between Sherwood Park (3) and Lloydminster (6), and Edmonton (4) and Peace Country (5). The St. Albert Raiders (1 North), North Central Impact (2 North), Calgary Fire White (1 South) and Calgary Fire Red (2 South) all earned first-round byes. EDMONTON - The 2018 Alberta Female Hockey League Prospects Games were a huge success, with the Midget Elite North and Bantam Elite South teams coming out on top in their respective games. Both games took place at the NAIT Arena in Edmonton, complete with on-ice goalie and skills sessions, team-building activities, and a fitting booth with one of the day’s sponsors, CCM, giving players the chance to try out various pieces of equipment throughout the day. In the Midget Elite All-Star game, the North team edged the South 3-2, with goals from Reagan Korber, Madison Porter and Brooklyn Schroeder. Madison Black and Brooke Palin scored for the South. It was a tight match-up in the Bantam Elite Prospects Game as well, with the South coming out on top 4-3. Claire Hobbs, Megan Yakiwchuk, Hailey Wiltshire, and Sarah Gaiser scored for the South team, while North got goals from Ardyn Hawryshko (2) and Jenna Goodwin. Two forwards and one defence from each AFHL team were selected to their respective rosters by AFHL coaches, while goaltenders were selected based on their statistical ranking as of January 10. The coaches chosen to represent the North and South teams in each league are from the first and second place teams within each division. The Alberta Female Hockey League would like to thank all the parents, players and coaches for making the AFHL Prospects games such a success. The AFHL would also like to thank all of the event sponsors: Gatorade Canada, CCM, Two Point Photography and Skate to Excel. RED DEER - With the first month of 2018 in the books, the Rocky Mountain Raiders (Midget AAA), St. Albert Sharks (Midget Elite), and Calgary Fire White (Bantam Elite) lead their respective leagues. It’s a four-way tie atop the Midget AAA leaderboard between Rocky Mountain Raiders forwards Chloe Puddifant, Breanne Trotter, and Nicole Fry, along with Red Deer’s Cassidy Maplethorpe, all with 24 points through four months of play. Trotter and Fry lead the way with 16 goals and 15 assists, respectively. St. Albert goaltender Brianna Sank is still tops the league with a 1.32 goals-against average and a .950 save percentage, and is tied for the league lead in shutouts (two) with teammate Camryn Drever, Lloydminster’s Molly Mitchell and Red Deer’s Chantelle Sandquist. Rocky Mountain Raiders goalie Stephanie Gross leads all Midget AAA goalies with 10 wins. Calgary Fire Red forward Sydney Benko leads the league in goals (19) and points (24), while Peace Country’s Karsyn May leads the way with 12 assists. St. Albert’s Holly Borrett leads all Midget Elite goaltenders with a 1.02 goals against average, while Edmonton’s Josie-Leah Cardinal remains atop the leaderboard with a .960 save percentage. Airdrie’s Cianna Weir continues to lead the way with 12 wins, while Cardinal and Calgary Fire White netminder Cassidy Brown are tied with four shutouts each. Sherwood Park’s Jenna Goodwin ended January on a strong note, sitting atop the league in goals (20) and points (29), with North Central’s Jacquelyn Fleming leading the way in assists, with 12. Alexandra Kieren continues her standout season with Calgary White, leading the way with a 0.81 GAA, a .950 save percentage, while St. Albert’s Layla Hood is tied for the league lead in wins (12) with Sherwood Park’s Asia Kachuk. Hood and Kieren both lead the league in shutouts, with 5 apiece. AFHL action will be on hold for the first weekend of February, as the AFHL Prospects Games take place on February 3 in Edmonton. Both AFHL Prospects games are set for February 3 at the NAIT Arena in Edmonton. The Bantam Elite Prospects Game goes at 2:30 p.m., with the Midget Elite Prospects Game to follow at 5:00 p.m. Prior to each Prospects games, participating players will take part in on-ice goalie and skills sessions, as well as a team-building activity. CCM will also be on site to allow players the chance to try out various pieces of equipment throughout the day. RED DEER – The Alberta Female Hockey League is pleased to announce the rosters for the 2018 Midget Elite and Bantam Elite AFHL Prospects games. RED DEER - As the 2017 portion of the 2017-18 Alberta Female Hockey League comes to a close, the Red Deer Sutter Fund Chiefs and Rocky Mountain Raiders (Midget AAA), St. Albert Sharks (Midget Elite), and Calgary Fire White (Bantam Elite) lead their respective leagues. Red Deer forward Cassidy Maplethorpe leads all skaters in assists (13) and points (24) through three months of play, and shares the lead for goals (11) with Rocky Mountain Raiders forward Breanne Trotter. St. Albert goaltender Brianna Sank sits atop the league with a 1.30 goals-against average and a .950 save percentage, and is tied for the league lead in shutouts (two) with teammate Camryn Drever, and Red Deer’s Chantelle Sandquist. Drever, Sandquist and Raiders goalie Stephanie Gross all lead the league in wins, with seven each. Lethbridge’s Hayleigh Craig leads the league with 18 points, while Airdrie forward Madison Black and Calgary Fire Red forward Sydney Benko share the lead with 13 goals each. Peace Country’s Karsyn May and St. Albert’s Annika Neset are tied for the league lead in assists, with 10 each. Airdrie’s Cianna Weir continues to lead Midget Elite goaltenders with 11 wins. St. Albert’s Cecelia Michelutti’s 0.80 goals against average and .960 save percentage are both tops in the league, while Edmonton’s Josie-Leah Cardinal remains atop the leaderboard with three shutouts. Peace Country’s Arilyn Toews and Calgary Fire White’s Sarah Gaiser lead all Bantam Elite skaters with 18 points apiece, while Sherwood Park’s Jenna Goodwin leads the way with 15 goals, and North Central’s Jacquelyn Fleming’s 10 assists is tops in the league. Alexandra Kieren continues her strong play with Calgary White, leading the way with a 0.87 GAA, a .950 save percentage, and four shutouts. Kieren’s counterpart, Kalynah Fong Martin is tied for the league lead in wins (eight) with Sherwood Park’s Asia Kachuk and North Central’s Laney Pasemko. The Airdrie Midget Elite team teamed up with the Airdrie Atom Female team to purchase turkeys to donate to the local food bank. They raised enough money to purchase 236 turkeys, well beyond their goal of 150. The team also collected 150 jackets and hoodies to donate to those in need in their communities. 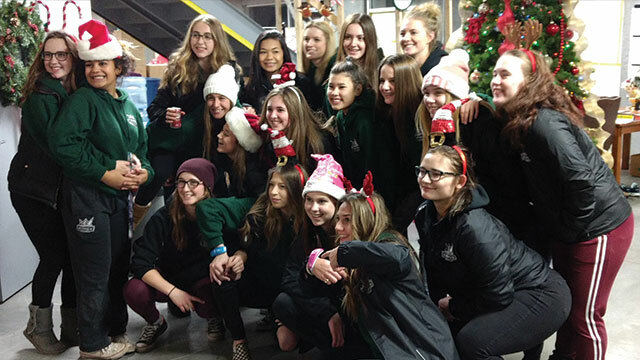 The Edmonton Bantam Elite Pandas of the Alberta Female Hockey League volunteered as porters at the Santas Anonymous depot, spending several hours bring bags of toys to the drivers. 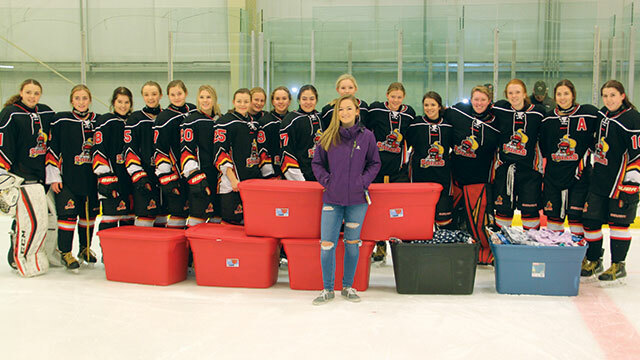 The Lloydminster PWM Midget AAA Steelers of the Alberta Female Hockey League provided a major boost to a local initiative called Project PJ, helping to collect new pajamas to donate to the Stollery Children’s Hospital in Edmonton. The North Central Impact decided to play Santa’s helpers for a young girl in Thorsby. They secretly took her Christmas wish-list and purchased many of the items for her. 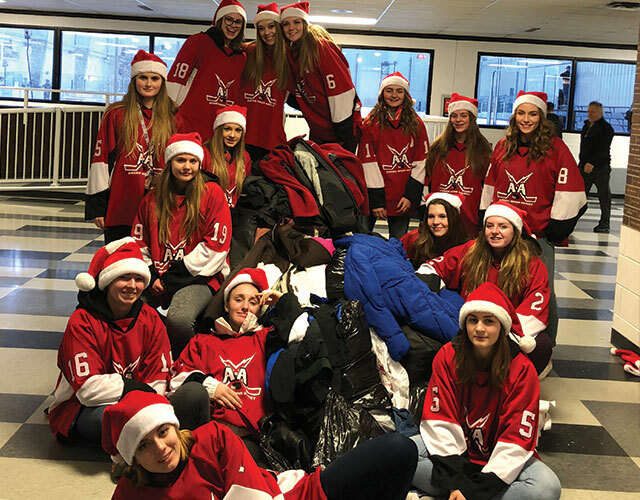 She thought she was coming to watch her first every hockey game but was surprised when the team sang her Christmas carols and presented her with gifts from every player. 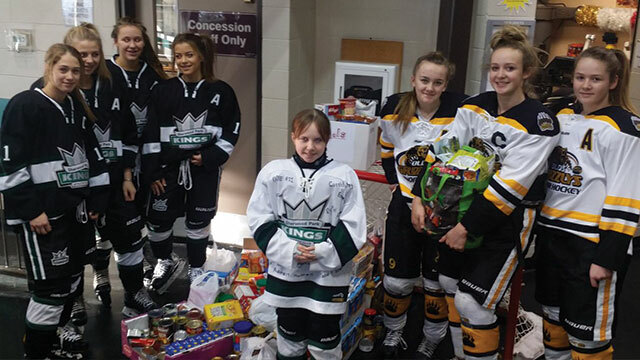 The Olds Bantam Elite Grizzlys of the Alberta Female Hockey League joined in on the Sherwood Park Royals’ "Fill the Net" fundraiser for the local food bank. 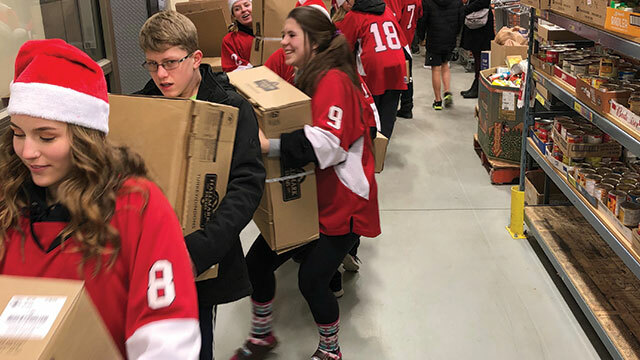 The Red Deer Sutter Fund Midget AAA Chiefs of the Alberta Female Hockey League hosted a "Fill the Net" food drive for the Red Deer Food Bank during a home game on December 2. 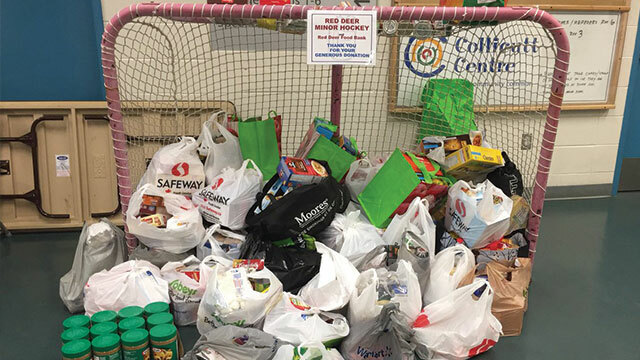 The Sherwood Park Midget Elite Fury of the Alberta Female Hockey League, along with other Sherwood Park Kings Athletic Club teams, collected dozens of bags and hundreds of pounds of food with their "Fill the Net" initiative at the annual "Kings Day" on December 2. "Since Steve Mancini started coaching the (Fury), his players and he have “given back”, especially with three years of a weakened economy in Alberta," said Manager Jeff Markowski. "Despite the Strathcona County area being relatively stable, many families are overcome by unemployment, abuse, and medical/health issues that disable their lives in unseen ways. Our local Bureaus and helping agencies are seeing fewer donors and funds come there way with each passing season." 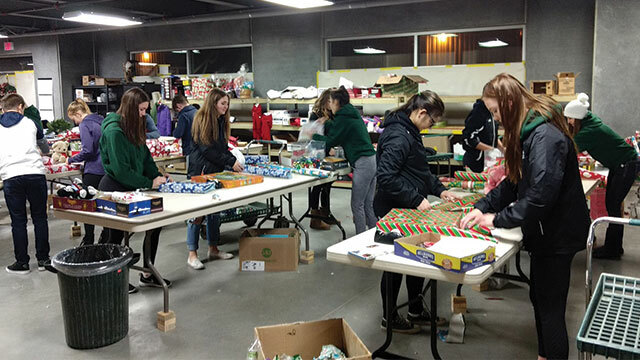 "This season, as in past, the Fury players and staff spent an evening at the local Christmas Bureau, finding and wrapping gifts and collecting food for those that would go without," said Markowski. 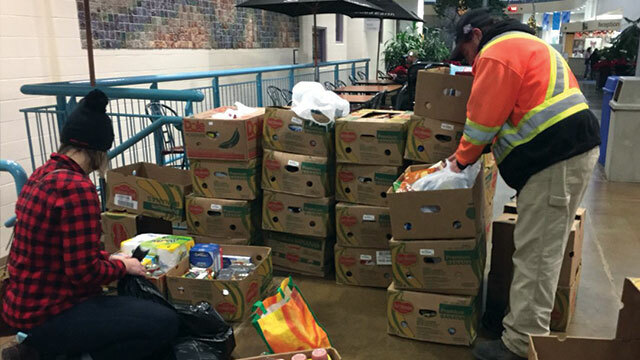 "Just over 30 families this year will be able to enjoy the their upcoming Holidays with a bit less stress on their minds, a few gifts of kindness, and food in their stomachs. Great giving Fury, and thanks for being the terrific young people you are!" RED DEER - The Alberta Female Hockey League will be well-represented in Fort McMurray in February. Of the 120 players selected to play in the 2018 Alberta Winter Games, 102 currently play in the AFHL’s Bantam Elite division. Six teams will take to the ice in Fort McMurray on February 16-19, with 120 female players (born 2003 and 2004) ready to take the first step in the Team Alberta program. Twenty players comprise each roster, along with volunteers serving as head coach, assistant coach, coach mentor, and director of operations. Rosters were selected based on performances at regional camps held December 8-10 in Morinville and Innisfail. The 2018 Alberta Winter Games run February 16-19 in Fort McMurray. 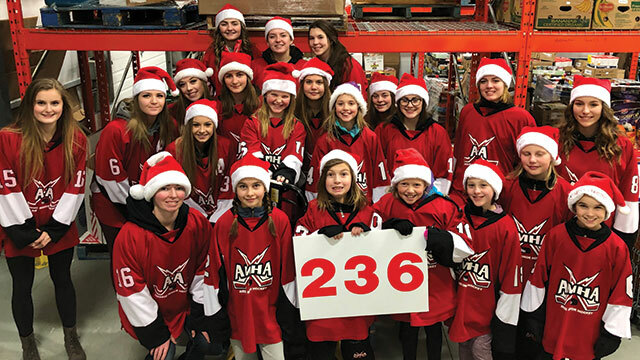 LLOYDMINSTER - What started out as a local initiative for the Lloydmister PWM Steelers, quickly turned into a league and province-wide success story this holiday season. Project PJ was started by 12 year-old Olivia Brockhoff in 2015, after a friend of her sister, who was going through cancer treatment at the Stollery Children’s Hospital, complained about the pajamas provided to her by the hospital. Now, every year, Olivia collects donations of pajamas to give to the hospital. Tanya Plamondon, whose daughter plays for the Steelers, brought the idea to the Midget AAA team, and it snowballed from there. "I’ve known Olivia and her parents for a long time, and I’ve been donating pajamas since she started (Project PJ)," said Tanya. "I wanted our team to do something big this season, so I mentioned it to (Head Coach) Randy (Laumbach), and we went from there. It worked out awesome since we had six home games to collect the pajamas in November, and we collected 89 pairs our first game through all us and our fans. The following weekend, we had the Calgary Fire and Edmonton Pandas accept our challenge to them, which was all in good fun, and the response was great. We also had the Rocky Mountain Raiders accept our challenge." The Fire, Pandas and Raiders collected a combined 140 pairs of pajamas. The captain of last year’s Steelers team, Tessa Mitchell, also challenged her current team, the MacEwan Griffins, to join the cause, adding another 125 pairs of pajamas to the team’s total, which were presented to the team on November 25, with Mitchell conducting the ceremonial faceoff. 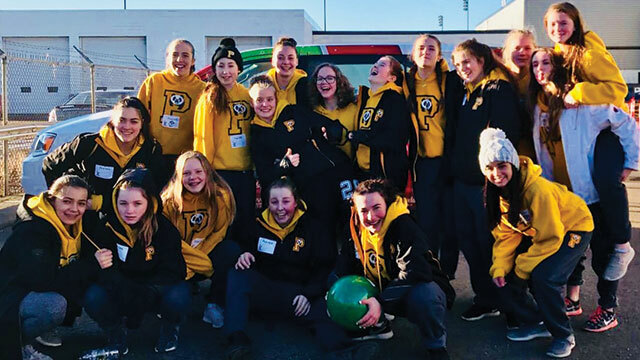 After an incredibly successful campaign for Project PJ, the Steelers managed to collect an astounding 513 pairs of pajamas, which were presented to Olivia during the team’s game on November 26. As of December 1, Olivia has collected over 1000 pairs of Pajamas through Project PJ, all of which will be donated to the Stollery Children’s Hospital. Hockey Gives Back - We want to hear from you! Hockey Alberta would like to showcase all of the hockey teams across Alberta who give back to their community this holiday season. Send your team’s story, along with photos, to info@hockeyalberta.ca to be featured on Hockey Alberta’s website. RED DEER - The second month of the 2017-18 Alberta Female Hockey League is now in the books, with the St. Albert Slash (Midget AAA), St. Alberta Sharks (Midget Elite), and Calgary Fire White (Bantam Elite) sitting atop the standings in their respective leagues. Red Deer forward Cassidy Maplethorpe leads all skaters in points (17) through two months of play, while Rocky Mountain Raiders forward Breanne Trotter (10 goals) and Calgary forward Mackenzie Loupelle (nine assists) lead the league in their respective categories. St. Albert goaltender Brianna Sank sits atop the league across the board with six wins, a 0.87 goals-against average, .970 save percentage and two shutouts. Lethbridge’s Hayleigh Craig leads the league with 16 points, and is tied with Airdrie forward Madison Black and Calgary Fire Red forward Sydney Benko with eight goals, while Peace Country’s Karsyn May holds the lead in assists with eight. Airdrie’s Cianna Weir continues to lead Midget Elite goaltenders with seven wins. St. Albert’s Cecelia Michelutti’s minuscule 0.67 goals against average is tops in the league, while Edmonton’s Josie-Leah Cardinal’s remains atop the leaderboard with two shutouts. Calgary Fire White’s Sarah Gaiser leads all Bantam Elite skaters with 16 points, while Sherwood Park’s Jenna Goodwin leads the way with 10 goals, and Lloydminster’s Jayde Cadieux is tied with Gaiser for the league leader in assists, with eight. Alexandra Kieren continues her strong play with Calgary White, with a stingy 0.20 GAA and .990 save percentage in five games, earning a shutout in all four of her wins. Kieren’s counterpart, Kalynah Fong Martin leads the league with seven wins. RED DEER - The first month of the 2017-18 Alberta Female Hockey League is now in the books, with the St. Albert Slash (Midget AAA), St. Alberta Sharks (Midget Elite), and Calgary Fire White (Bantam Elite) sitting atop the standings in their respective leagues. Rocky Mountain Raiders forward Chloe Puddifant leads all skaters in points (12) through the first month of play, while Lloydminster forward Kelsey Hall (five goales) and Calgary forward Mackenzie Loupelle (five assists) lead the league in their respective categories. Goaltender Bella McKee was strong in net for Lloydminster in October, with a league-leading four wins. McKee’s 1.20 goals against average puts her second in the league, behind teammate Molly Mitchell, who currently holds a 1.00 GAA, while both goalies are tied for the league lead with a .960 save percentage. Outside of league play, eight AFHL players were named to Team Alberta’s U18 roster in October, and are currently competing at the 2017 National Women’s Under-18 Championship in Quebec. Peace Country’s Shauna Johnson sits atop the leaderboard in goals (six), and is tied with Lethbridge’s Hayleigh Craig for the lead league in points (eight), while Johnson’s teammate, Karsyn May, holds the lead in assists (six). Airdrie’s Cianna Weir and Peace Country’s Madison Doucette both set the pace for goaltenders in October with three wins each. Edmonton’s Josie-Leah Cardinal recorded two shutouts in four appearances (with two wins), while seven goaltenders sit tied for second with one shutout in October, including St. Alberta’s Cecelia Michelutti, who leads the league with a 0.50 GAA and a .970 save percentage in two starts. Peace Country’s Charlieze Sallis set the pace for skaters in October with 10 points. Sherwood Park’s Jenna Goodwin leads the way with six goals, while Edmonton’s Sydney Dutertre is the league leader in assists, with five. Through three games, Alexandra Kieren has been a wall in net for Calgary White, with a stingy 0.32 GAA and .980 save percentage in two wins and a shootout loss, along with two shutouts. Kieren’s counterpart, Kalynah Fong Martin, and Sherwood Park’s Asia Kachuk are tied for the league lead with four wins each. RED DEER - The 2017/18 Alberta Female Hockey League season is officially in full-swing, as the Midget Elite and Bantam Elite seasons get underway on Saturday. The AFHL season began on October 1 for the Midget AAA division, two weeks ahead of the Midget and Bantam Elite seasons. Eight of 12 teams on both Midget and Bantam Elite sides begin their season on Saturday, while the remaining four get their 2017/18 season underway on Sunday. RED DEER - Eight Midget AAA players from the Alberta Female Hockey League have been selected to suit up for Team Alberta’s U18 Female squad for the 2017 National Women’s Under-18 Championship in November. Goaltender Camryn Drever (St. Albert Slash), and forwards McKenzie Hewett (St. Albert Slash) and Chloé Puddifant (Rocky Mountain Raiders) will all represent Team Alberta once again, having played in last year’s U18 National Championships. Defenders Mackenzie Butz (St. Albert Slash) and Isabella Pozzi (Rocky Mountain Raiders), and forwards Brooke Dennett (Calgary Fire), Breanne Trotter (Rocky Mountain Raiders) will represent their province for the first time, while and Nicole Fry (Rocky Mountain Raiders) will join Team Alberta for the second time, having played in the 2015 U18 National Championships. The AFHL will also have representation on Team Alberta’s coaching staff, as Red Deer Head Coach Bob Rutz will serve as as Assistant Coach. The 2017 National Women’s U18 Championship runs November 1-5 in Quebec City. The National Championship event brings together the top U18 female players from across Canada in an eight-team tournament, featuring teams from British Columbia, Alberta, Saskatchewan, Manitoba, Ontario (Red and Blue), Quebec and Atlantic. For schedule and ticket information for the National Women’s U18 Championships, click here. RED DEER - Female hockey is currently one of the fastest growing sports in our province, with close to 8,000 females already participating. Hockey Alberta and our associations are working hard to create new programs to introduce the game to new female hockey players as well as developing our current participants. Female hockey offers the opportunity for young girls to engage in a healthy, active lifestyle while learning valuable life lessons and developing new friendships that will last after the hockey season ends. Whether your daughter is just starting out or has been playing for a number of years – there are a number of great opportunities for her to become involved in female hockey at the grassroots level. As the number of female hockey players in Alberta grows, the need for female coaches and officials grows with it. You can join our team as a coach or official, and help inspire the next generation of players in your local association by sharing, your knowledge, skills and memories. For more information on Minor Female Hockey, and for a list of FAQs, please click here. RED DEER - The 2017/18 Alberta Female Hockey League season officially gets underway today (Sunday) across the province, with all six Midget AAA teams in action. The Lloydminster PWM Steelers are at home against the Edmonton Pandas, the Rocky Mountain Raiders are set to host the Red Deer Sutter Fund Chiefs, and the Calgary Fire pay a visit to the St. Albert Slash. The Midget Elite and Bantam Elite seasons both get underway on Saturday, October 14. World Girls Hockey Weekend - Join the celebration! RED DEER – World Girls Hockey Weekend is quickly approaching, and your team can help us celebrate the female game across the province, country, and world! For the sixth year in a row, the women’s hockey world will come together for three days – this year from Oct. 6-8 – to celebrate World Girls’ Hockey Weekend. Associations and teams from across Alberta are encouraged to join in on the global celebration by hosting an event – it doesn’t even have to be about playing the game! Need a few ideas? Click here. Want to register an event or celebration? CLICK HERE! In addition to local events, the centrepiece of the weekend for Canadians, as it has been for the past four years, is the Long Game, which brings together players in every province and territory for Red and White bragging rights in five age groups – Atom, Peewee, Bantam, Midget and Senior. For the second straight year, Edmonton will host the Alberta leg of the Long Game, capped off with a game between the Knights of Columbus Midget AAA team and the National Women’s Team. For more information on World Girls’ Hockey Weekend, to find out what’s happening in your area or to follow along with the Long Game, click here. For the celebration to be heard around the world, you can spread the word on social media! Share your story, and your pictures! To join the conversation, use and follow the hashtags: #LongGame and #WGIHW. CALGARY - A unique opportunity is available for aspiring female coaches to attend a female-only coach clinic in Calgary this fall. The We Are Coaches clinic runs from 8:15 a.m. until 2:30 p.m. at the Max Bell Arena in Calgary on September 17. The clinic includes an in-class session in the morning, and an on-ice session after lunch. The program is free of charge. Attendees will need to bring their skates, gloves, stick and helmet, as well as their own lunch. Upon completion of the Coach 2 - Coach Level course AND the HU-ONLINE Coach 1/2 one will achieve “TRAINED” status. There is no post-task associated with the Coach 2 – Coach Level Course to achieve “CERTIFIED”. For more information, please contact Kendall Newell, Manager, Female Hockey. RED DEER - More than 20 graduating Midget players from the Alberta Female Hockey League will be suiting up for post-secondary teams this fall. MORDEN, MB - For the first time in the tournament’s history, the Esso Cup is coming home to Alberta. The Alberta Female Hockey League’s St. Albert Slash are 2017 Esso Cup Champions after defeating Quebec 1-0 in an overtime thriller Saturday night. The Slash were dominant at the tournament, going a perfect 7-0 en route to a national championship. St. Albert represented the Pacific Region at the Esso Cup, defeating the Greater Vancouver Comets in the Pacific Regional Championships, after winning the Hockey Alberta Midget Female AAA Provincial Championships. MORDEN, MB - Alberta is well-represented on the National stage this week, as the St. Albert Slash compete in the Esso Cup in Morden, MB. The St. Albert Slash (Midget Female AAA) of the Alberta Female Hockey League are representing the Pacific region at the tournament, and are already off to a hot start. The Slash opened the Esso Cup Sunday afternoon with a 6-0 win over Mid-Isle Wildcats, who are representing the Atlantic. The Slash are in action again Monday night at 6:00 p.m. MST against the host Pembina Valley Hawks, and will play Quebec, the West, and Ontario on Tuesday, Wednesday and Thursday to complete round-robin play. RED DEER - Registration information is now available for Midget AAA and Midget EliteSpring Identification camps. RED DEER – The Alberta Female Hockey League is proud to announce the 2016-17 league award and scholarship winners. RED DEER - The 2017 Provincial Champion St. Albert Slash have punched their ticket to the 2017 Esso Cup. The Midget AAA St. Albert Slash defeated the Greater Vancouver Comets in the Pacific Regional Championships this past weekend, earning the right to represent the Pacific Region at the annual national championship. The Slash swept the Comets in the best-of-three series by scores of 2-0 and 3-2. The 2017 Esso Cup runs April 23-29 in Morden, Manitoba. For more information on the Esso Cup, click here. ST. ALBERT - The Alberta Female Hockey League Midget AAA Provincial Champions, the St. Albert Slash, welcome the Greater Vancouver Comets to town for the Pacific Regional Championships this weekend. Game 1: Friday, March 31 at 7:00 p.m.
Game 2: Saturday, April 1 at 7:00 p.m. The winner of the series will represent the Pacific Region in the 2017 Esso Cup in Morden, Manitoba on April 23-29. RED DEER - The Red Deer Sutter Fund Chiefs are the inaugural Alberta Female Hockey League Midget Elite Provincial champions. The Chiefs went undefeated through the tournament (3-0-1), and defeated the regular-season champion Peace Country Storm 4-1 in the final to claim gold. Girls Hockey Calgary added yet another 2017 Provincial medal to its collection as the Calgary Fire Red earned bronze with a 3-2 overtime victory over host Sherwood Park. Calgary Fire White’s Danika Stang took home the Midget Elite scoring title with 22 goals and 9 assists for 31 points, while while Red Deer’s Danica Polson and Avery Lajeunesse round at the top three with 29 and 26 points, respectively. Jayda Thompson of Red Deer finishes the year off on top of the leaderboard with a .970 save percentage. She holds a 10-1-1 record on the season with 6 shutouts. Peace Country’s Paige Jassman leads all AFHL goaltenders in games player with 24 and has an impressive record of 21-2-1. Calgary Fire Red’s Gabriella Durante led all goaltenders with 7 shutouts on the season. In the race to the Hockey Alberta Provincial Championships, presented by ATB Financial, Red Deer, Peace Country, and Calgary Fire Red won their respective playoff series to secure a spot in the Provincials, as well as the Edmonton Pandas, who narrowly lost their second round series against host Sherwood Park. The Midget Elite Provincials run March 23-26 in Sherwood Park.Tournament information and scores can be found on the Midget Elite Provincial website. RED DEER - The Midget AAA St. Albert Slash and Bantam Elite Calgary Fire White are the inaugural Alberta Female Hockey League Champions, winning their respective Provincial Championship titles this weekend. The Slash entered the Hockey Alberta Provincial Championships, presented by ATB Financial, as the AFHL Midget AAA regular season champs, and went wire-to-wire as the league’s top team with a 2-0 win over the host Rocky Mountain Raiders in the gold medal game. The Calgary Fire defeated the Red Deer Sutter Fund Chiefs 3-1 in the bronze medal game earlier in the day. Just like St. Albert, the Calgary Fire White came into the Bantam Elite Provincials as the top team, and cemented their spot atop the league by edging the St. Albert Raiders 1-0 to claim gold. Girls Hockey Calgary earned its third medal of the day, as the Calgary Fire Red earned bronze with a 4-3 over the Sherwood Park Royals. The stage is now set for the third and final AFHL Provincial Championship, as the Peace Country Storm, Edmonton Pandas, Red Deer Sutter Fund Chiefs, Calgary Fire Red, and host Sherwood Park Fury battle for the Midget Elite title. The Midget Elite Provincials run March 23-26. RED DEER - The Alberta Female Hockey League’s Midget AAA regular season has officially come to a close, and the Provincial Championships for Bantam Elite and Midget AAA kick off on Thursday and Friday. St. Albert’s first year forward Madison Willan takes home the league scoring with 25 goals and 25 assists for 50 points. Willan’s teammates Cassidy Maplethorpe and Tyra Meropoulis round out the top three point leaders with 46 and 45 respectively. Maplethorpe also finished the season leading the league in assists (29). Two goaltenders tied for top save percentage of the seson, both with a .940; St. Albert’s Camryn Drever and Red Deer’s Chantelle Sandquist (Red Deer). Drever boasts a 1.38 goals against average and a 14-3-0 record, while Sandquist appeared in 11 games, posting a 6-3-1 record with a 1.60 goals against average. AFHL Action heated up as the race to the Hockey Alberta Provincial Championships kicked off last weekend. The regular season champion St. Albert received a bye into the tournament, as well as host association Rocky Mountain Raiders. In the first round series, the third-place Calgary Fire faced off against the sixth-place Edmonton Pandas and won the two game, total point series by a score of 6-5. The other series featured the fourth-place Red Deer Chiefs and fifth-place Lloydminster in a low-scoring battle. Red Deer skated away victorious as Kaitlin Linnel scored on a rebound to seal the victory for Red Deer on Sunday afternoon. The inaugural AFHL Midget AAA Provincial Championship will start on Friday morning, March 17 at Scott Seaman’s arena and will feature our top four teams from the regular season; (1) St. Albert, (2) Rocky Mountain Raiders, (3) Calgary, and (4) Lloydminster. If you are unable to make it Okotoks this weekend, you can still catch the games online! The live video and audio streams, as well as updates on scores will be provided on the AAA Provincial website. The Bantam Elite Provincial Championships kick off this weekend as well in Olds March 16-19. The five-team tournament features the Calgary Fire White, Calgary Fire Red, St. Albert Raiders, Sherwood Park Royals, and Olds Grizzlys. Tournament information and scores can be found on the Bantam Elite Provincial website. RED DEER - The Alberta Female Hockey League’s Bantam Elite division wrapped up its inaugural season on February 26. The Calgary Fire White (21-2-2) are taking home not South Division crown, but the league’s regular season title as well, although the Northern Division-leading St. Albert Raiders (21-3-4) gave them a run for their money. Olds’ Sarah Wozniewicz claimed the league scoring title, finishing with 27 goales and seven assists for 34 points. goals (23) and points (28). Calgary Red’s Emily Straw and North Central’s Chloe Reid round out the top three in points with 31 and 30, respectively. Another Grizzly topped the regular season leaderboard, as netminder Jocelynn Pearce ended the regular season with a league-best .950 save percentage, to go allong with an 11-2-0 record and five shutouts. The road to the Hockey Alberta Provincial Championships, presented by ATB Financial, is now laid out, as the first-round playoff matchups are set. In the North Division, the St. Albert Raiders receive a first-round bye, while the North Central Impact will battle the Edmonton Pandas, and the Peace Country Bonnett’s Storm will take on the Sherwood Park Royals. Calgary Fire White advance directly to the second round in the South, with the Rocky Mountain Raiders going head-to-head with Calgary Fire Red, and the Red Deer Sutter Fund Chiefs up against the Lethbridge Cyclones. All playoff matchups are two game, total-goal series. The winning teams from each second round series will advance to the Provincial Championship. RED DEER – The first month of 2017 has come to a close in the Alberta Female Hockey League, with the St. Albert Slash (Midget AAA) still in the lead, while the Sherwood Park Fury (Midget Elite), and St. Albert Raiders (Bantam Elite) have moved to the top of their respective leagues. St Albert’s first year forward Madison Willan continues to lead all skaters in goals (17), assists (18) and points (35), with her teammates Cassidy Maplethorpe and Tyra Meropoulis right behind her in total points with 31 and 28, respectively. Four goaltenders sit tied atop the league with a save percentage of .940; St. Albert’s Brianna Sank, Calgary’s Katie Crowther, Red Deer’s Chantelle Sandquist and Lloydminster’s Bella McKee. Sank boosts the top goals against average with 1.31 and three shutouts on the season while her counterpart in St Albert, Camryn Drever, leads the way with 11 wins. Red Deer’s Danica Polson leads all skaters in points (22) and goals (17) as January comes to a close, while Calgary Fire White’s Sydeny Spicer holds the lead in assists with 11. The inaugural AFHL All Star Game was hosted in Penhold, Alberta on January 14, 2017. A full recap and list of participants can be seen here. Olds’ Sarah Wozniewicz heads into February the league-leader in goals (23) and points (28). Sherwood Parks’ Vanessa Verbitsky is not far behind with 25 points, and leads the league with 15 assists. St. Albert’s Holly Borrett and Olds’ Jocelynn Pearce continue to lead the way with 0.960 save percentages and .68 and .89 goals against averages, respectively. Borrett’s counterpart in St. Albert, Elle Boyko, remains the league-leader wins with seven. The inaugural AFHL All Star Game was hosted in Strathmore, Alberta on January 14, 2017. A full recap and list of participants can be seen here. Outside of the rink, many of our AFHL Teams participated in the inaugural Alberta Hockey Day. The focus and theme was on the introduction, development and celebration of female hockey. Thank you to our AFHL members Calgary, Lloydminster and Leduc (North Central) for participating and helping spread the message of #WhyWePlay. RED DEER/STRATHMORE – The inaugural Alberta Female Hockey League All-Star celebrations were a huge success, with the Midget Elite South and Bantam Elite North teams coming out on top in their respective games. In the Midget Elite All-Star game, which was hosted in Red Deer, the South team used a three-goal second period to defeat the North team 5-1, with five different players (Shaelynne Bilodeau, Paige Koochin, Rebecca Toney, Brooklyn Palmer and Hannah Chase) lighting the lamp for the South. Payden Bialowas scored the lone marker for the North. Gabriella Durante, Jenna Patrician and Jayda Thompson each spent a period in goal for the South, while Natasha Borrett, Rebecca Bridge and Sara McNamara shared duties for the North. In Strathmore for the Bantam Elite All-Star Game, the North edged the South in an exciting 1-0 contest. Justine Brady scored the lone goal of the game for the North, with Holly Borett, Elle Boyko and Molly Mitchell all combining for the shutout win. Jessica Flegel and Jocelynn Pearce split time in goal for the South. The Alberta Female Hockey League would like to thank all the parents, players and coaches for making the AFHL All-Star games such a success. The AFHL would also like to thank all of the event sponsors: ATB Financial Strathmore, Canadian Tire, Longball Inc, Stantec, and Looker Office Furniture. RED DEER – As the 2016 portion of the Alberta Female Hockey League season comes to a close, the St. Albert Slash (Midget AAA), Red Deer Sutter Fund Chiefs (Midget Elite), and Calgary Fire White (Bantam Elite) all lead their respective leagues heading into 2017. St Albert’s first year forward Madison Willan closes out 2016 leading all skaters in points (24) and assists (11). Rocky Mountain Raiders forward Nicole Fry is tied with Willan for the lead league in points, and leads the way goals (15). AFHL puck stoppers had another strong month with three goaltenders at the top all with a .940 save percentages: St. Albert’s Brianna Sank, Calgary’s Katie Crowther and Lloydminster’s Bella McKee. Sank boasts three shutouts while her counterpart in St Albert, Camryn Drever, leads the way with 8 wins on the season. Outside of AFHL Play, Calgary Fire, Lloydminster Steelers and Rocky Mountain Raiders traveled to Saskatchewan to compete in the Mandi Schwartz Memorial Tournament. All three teams has a strong showing and competed hard throughout the weekend. Calgary Fire White’s Danika Stang has taken over the league lead in points with 19, while Red Deer’s Danica Polson holds the lead in goals (14), and St. Albert’s Payden Bialowas leads the way in assists (10). Jayda Thompson of Red Deer continues to lead all Midget Elite goaltenders with a .860 goals against average, a 960 save percentage, along with six wins on the season. Peace Country’s Paige Jassman leads the way in wins and shutouts, with 12 and six, respectively. There are three skaters currently on top of the leaderboard with 18 points each to close out 2016; North Central’s Chloe Reid, Lethbridge’s Isabelle Dyck, and Calgary Fire Red’s Emily Straw. Olds’ Sarah Wozniewicz has 13 goals to lead all Bantam skaters, while Lloydminster’s Madison MacDuff leads the way with 12 assists. St. Albert’s Holly Borrett and Olds’ Jocelynn Pearce both sit atop the league with a 0.960 save percentage, while Borrett’s counterpart in St. Albert, Elle Boyko, leads the way in wins with seven. Teams have earned a well-deserved winter break and league play will resume on January 7, after the holidays. January will be an exciting month as league play resumes as well the AFHL host its inaugural All Star Games and AFHL teams will help celebrate Alberta Hockey Day on January 21. RED DEER – The Alberta Female Hockey League is pleased to announce the rosters for the inaugural Midget Elite and Bantam Elite AFHL All-Star games. Two forwards and one defence from each AFHL team were selected to their respective All-Star rosters by AFHL coaches, while goaltenders were selected based on their statistical ranking as of December 19. The coaches chosen to represent the North and South teams in each league are from the first and second place teams within each division. Both All-Star games are set for January 14 – with Red Deer hosting the Midget Elite game, and Strathmore hosting the Bantam Elites. The Midget Elite All-Star game begins at 1:30 p.m. at the Penhold Regional Multiplex, and the Bantam Elite All-Star game gets underway at 1:45 at the Strathmore Family Centre. In addition to the All Star games, the host Associations will be offering development clinics for female athletes within their communities. The Midget Elite Calgary Fire White & Red teams pose for a photo following their battle at Wickfest. RED DEER – As the Alberta Female Hockey League moves into December, the St. Albert Slash (Midget AAA), Red Deer Sutter Fund Chiefs (Midget Elite), and Calgary Fire White (Bantam Elite) all lead their respective leagues after two months of play. Rocky Mountain Raiders second-year forward, Nicole Fry, leads all skaters in goals and points with 14 goals in 23 points. Madison Willan of the St. Albert Slash and Breanna Trotter of the Raiders finished the month as the assists leaders with 10 each. November was another strong month for goaltenders, as St. Albert’s Brianna Sank and and Lloydminster’s Bella McKee lead with the way with a .960 and .950 save percentages, respectively. Sank also leads the league with a .850 goals against average, seven wins and three shutouts heading into December. Outside of AFHL Play, Calgary Fire captured a Gold Medal and the Joan Snyder Cup in the annual WickFest tournament in Calgary. St. Albert’s Payden Bialowas leads all skaters in points (13) and assists (9) in 11 games played, while Rocky Mountain Raiders forward Bryana Sharkey and Red Deer forward Danica Polson share the league lead in goals with eight each. Goaltending was strong once again in November, with Jayda Thompson of Red Deer continues leading the way with a .500 goals against average, a .980 save percentage, and four wins on the season. Outside of AFHL Play, Calgary Midget Elite Fire White battled Midget Elite Fire Red in the final for the Elite Division at WickFest. Calgary Fire White came out on top and took home the gold while Fire White captured the silver! Second-year bantam, Chloe Reid leads all Bantam Elite skaters in goals, assists and points. Reid currently has 17 points (8G, 9A) and is tied with MacKenzie Stafford of Lloydminster for the lead in goals. Jocelynn Pearce of Old sits atop the league with a .990 save percentage and .250 goals against, and four wins leading into December. She is tied for most wins with fellow goaltenders Elle Boyko, Taryn Ofstie and Piper Slezak. Outside of AFHL Play, Calgary Fire Bantam Red and Fire White won their respective divisions at the WickFest tournament. Teams will be battling it out in December to earn valuable points in the standings before the league breaks for winter holidays after December 18, with play resuming on January 6. GRANDE PRAIRIE - Hockey Alberta is proud to host its inaugural Alberta Hockey Day on January 21, 2017, to celebrate and showcase female hockey across the province. This day will combine a number of on and off-ice events catered to both new and existing participants, focusing on fun, skills and friendships. Grande Prairie will be the host site of Alberta Hockey Day’s main event, with special guests scheduled to attend, including two-time Olympic gold medallist and former Team Alberta player and coach Carla MacLeod. Edmonton, Calgary, Leduc, Lloydminster, Medicine Hat, Lethbridge, Olds and Banff/Canmore will also host Alberta Hockey Day Events. Hockey Alberta’s goal is to develop female players, coaches and officials who are currently in our program while introducing the sport to new participants. All sessions offered throughout the day will be at no cost to the participants, in an effort to connect our sport to a larger audience. REGINA – The Alberta Female Hockey League will be well represented as Team Alberta goes for gold at the National Women’s U18 Championship. Seven athletes from the AFHL’s Midget AAA division were selected for Team Alberta’s 20-player roster for the U18 Nationals, which begins today (Wednesday) in Regina. Goaltender Camryn Drever (St. Albert), defenders Stephanie Markowski (St. Albert) and Madison Laplante (Edmonton), and forwards Kennedy Brown and Rachel Weiss (Rocky Mountain Raiders), Jayden Thorpe (Lloydminster), and Tyra Meropoulis (St. Albert) will all represent their province – and the AFHL – at the annual national tournament. Team Alberta kicks off its tournament at noon today (Wednesday) against Team Quebec. For a full schedule, and more information on the U18 Nationals, click here. On the eve of the inaugural season for the new Alberta Female Hockey League, we’d like to take a moment to reflect on the game we all love and the significant efforts from volunteers and staff to get us to this point. With admiration and respect we appreciate the commitment from past leagues and volunteers, the stewards of our game for our daughters, from these people lie the roots of our great program . The changes we embarked on three long years ago were to renew this great program bringing forth a new and improved model for our players of today and tomorrow. Focusing on athlete development, peers playing with peers and a sustainable model that recognizes the societal and economic demands on our Alberta families, the foundation was laid for a successful transition to a new model that best meets the needs of our membership. While the hard work of our volunteers and staff never ends, the heaviest of lifting is now behind us, and at this point the focus and efforts are turned to our coaching staffs and our players . Coaches provide the opportunities for players to succeed, give them the skills and confidence both on and off the ice to not only be the future of our game, but the future of our communities. Like all athletics, this is a game—a special one—and we do keep score, but ultimately, success is measured tomorrow and years from now by the development of your players and the growth of our game. For the players, take the time to thank the people that make this game and these opportunities available to you. Your coaches and trainers, the rink staff, the donors for your fundraising, are all contributing to you having a chance to participate in something special, moments you will never forget. Most importantly, appreciate your parents’ commitment to you, it is not always easy being a hockey parent and they do it for you not themselves. Focus on your development as a player and the success of your team, play the game hard and fast, the way its intended, and give back to your communities. Be the leaders of tomorrow setting a path of tradition, history, and success for our future players. Lastly to our fans, thank you for commitment to our game for putting your daughters in skates and teaching 4 year-olds a slap shot in the driveway. Cheer passionately and loudly, respect the officials and the coaches who are providing our girls with a game to play. In our own ways we all play for Team Alberta, on or off the ice, you all contribute to our success and this game... Our game, and Team Alberta’s time is now. The 2016-17 AFHL season begins on Saturday for all six Midget AAA teams. The Midget Elite and Bantam Elite seasons kick off on October 15. You can follow along with scores on stats on each respective AFHL site, or follow the AFHL on Twitter. Female Coaches: Sign up now for a free coach clinic! Hockey Alberta is offering two FREE OF CHARGE Coach 2 Courses for female coaches in Alberta. - Females who are coaching or looking to get into coaching in the province of Alberta. - If you are more comfortable in a class with all females, learning from a female instructor. - Coach 2 emphasizes basic skills and the importance of having players develop confidence, self-esteem and a love for the game. - You receive manuals with a year’s worth of progressive practice plans. - Required for coaches at the Atom-Midget level (excluding AA & AAA). - Hockey Alberta is dedicated to expanding the female coaching knowledge in the province of Alberta, and is proactively seeking more female coaches and providing them with development opportunities. For further information about the course, or to register, please contact Kendall Newell (knewell@hockeyalberta.ca) at the Hockey Alberta Office. RED DEER - Hockey Alberta is proud to introduce a brand new website for the newly created Alberta Female Hockey League (AFHL). The new site, afhl.ca, is the official portal for the three divisions of the Alberta Female Hockey League: Midget AAA, Midget Elite, and Bantam Elite. - A fully responsive site that automatically adjusts to the size of your screen, including mobile devices and tablets. - Full schedules for each league, including a link to the Google map location of each rink. - A score ticker across the top of the page. - A stats page for both players and goaltenders, updated automatically once a game score is inputted. - A league message board, so teams can interact with each other throughout the season. - A Social Media feed allowing you to keep up with the AFHL on Twitter and Facebook. The main page of the site will also be updated regularly with league news and information. Schedules have been added for Midget AAA and Bantam Elite, with the Midget Elite schedule to be added once it’s finalized. The new website was designed by Edmonton’s Pixel Army, who also re-designed hockeyalberta.ca, and created haprovincials.ca and abcup.ca , both of which the AFHL site is modeled from. Pixel Army worked with Hockey Alberta staff to ensure functionality and appearance that meets the needs of the organization, and the entire hockey community across the province. September 06, 2017 World Girls Hockey Weekend - Join the celebration! September 13, 2016 Female Coaches: Sign up now for a free coach clinic!